Properties in Castelnuovo Magra average 4.5 out of 5 stars. Property 31: A relaxing holiday between Lerici and Cinque Terre. Elegant Casale, near the Cinque Terre. 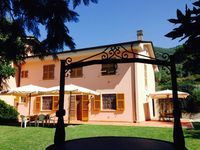 Property 37: Elegant Casale, near the Cinque Terre. Very authentic Italian village in the mountains! We loved this little authentic apartment and village! We had some trouble finding it but when we did find the square we were meet by the owner. The drive up was a bit scary if you are driving be prepared for uphill hairpin turns. Yikes! The walk to the apartment was very interesting as well. Not bad but very authentic with steep hills and cobblestone roads. Sensible shoes are key :). There is also no market or restaurants up there so be prepared and bring food or eat in advance. We luckily had food with us! The apartment is great with a full kitchen although we could have used a little olive oil for our pasta. The rooms were nice and beds comfortable. Nice bathroom with a hot shower. The views were amazing in the morning. Stay for longer than one night if possible. It's a lot of effort to get there but worth it if you have more time to relax. Very nice and spacious house with beautiful garden. Very nice and spacious house with beautiful garden. Clean and good quality interior, including some Carrara marble. Parking potential for at least 2 to 3 cars. Air conditioning enables comfortable sleep even during the hotter period of Italian summer. House is suitable also for larger groups with children. Good quality grocery stores are nearby which enables making use of the kitchen of the house and arranging family dinners in the garden. Tuscany region main sights/attractions (Cinque Terre, Pisa, Firenze etc) are near but car is recommendable.